The BMW X5 is a four-door, up to seven passenger luxury sport-utility vehicle. The BMW X5 was the Bavarian automaker’s first SUV. Stubbornly refusing to classify it as such, BMW preferred to use the term ‘sport activity vehicle’ in an effort to preserve the brand’s image as a provider of excellent sporting automobiles. The X5 debuted in 1999 as a direct answer to the wildly successful Mercedes-Benz M-Class, which had been released two years earlier. It managed to maintain a high degree of on-road performance while still providing more than serviceable 4x4 capabilities, making it a popular addition to the BMW lineup. The BMW X5 is riding on a platform which was updated in 2006. Longer and wider than the original X5, the newer SUV also features a more streamlined look that trades in some of the previous generation’s smoother lines for a mixture of chunky edges and hard creases. Inside, the vehicle is blessed with greater interior room to go with its larger dimensions: optional third row seating provides accommodations for up to seven passengers in leather-swathed luxury. Sport seats which grip the bodies of the driver and front passenger to hold them in place during spirited driving belie the sedan philosophy which underpins the vehicle. The X5 is equipped with iDrive, a rotary controller which serves as BMW’s premium interface to its climate control, stereo and navigation systems, and buyers can also equip the SUV with a rear-facing camera for easier parking, 19-inch wheels, an anti-rollover system which works both on and off the road, and a DVD system for rear passengers. There are two engines available with the X5. The base model 3.0si shares its 260 horsepower, 6-cylinder engine with the X3. 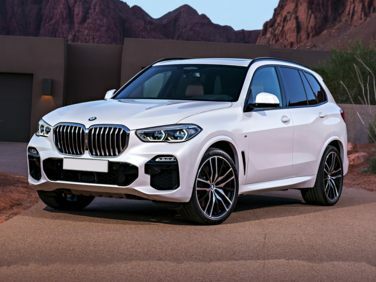 Stepping up to the X5 4.8i provides drivers with a 350 horsepower V8 engine which helps to mitigate the fact that the X5 is 1000 lbs heavier than its smaller sibling. Acceleration is metered out by the 6-speed automatic transmission, (which is the only option for either trim), and the V8 feels much more lively than the somewhat underpowered inline 6. The X5 is equipped with all-wheel drive, and this in combination with the weight helps to sink the fuel economy numbers to an underwhelming 14 miles per gallon in the city and 19 on the highway for the larger engine. The 6-cylinder provides marginally better numbers. Despite the weight and size handicap, BMW engineers have clearly put a lot of work into making sure that the X5 feels far more like a sports sedan than a truck. When driving on challenging roads, the SUV pushes drivers to take corners faster than they would feel comfortable doing in many of the other luxury sport-utility vehicles on the market. This confident handling is backed up by equally impressive stopping power. *** The BMW X5 continues to be a segment leader for trucks which clearly think they are cars. For anyone who is reluctant to leave their luxury sedan behind, but requires the ability to haul a reasonable amount of cargo or the extended family on a camping, the X5 makes the journey almost as fun as the destination. The 2009 BMW X5 is a carryover from 2008, with the exception of a diesel engine being offered for the first time in this sport-utility vehicle. There are three different trim levels for the 2009 X5, all of which feature all-wheel drive as standard equipment. The entry-level xDrive30i SUV is powered by a 3.0 liter, 6-cylinder engine that generates 260 horsepower and 225 lb-ft of torque. A 6-speed automatic transmission handles gear shifts, and fuel economy is rated at 15 miles per gallon in the city and 21 miles per gallon on the highway. The next step up is the xDrive48i, which substitutes a 30 horsepower, 4.8 liter V8 engine in place of the smaller inline 6. This unit feeds 350 lb-ft of torque through a 6-speed automatic transmission. For 2009, the xDrive35d edition of the BMW X5. This edition of the sport-utility vehicle makes use of a twin-turbo 6-cylinder diesel motor that displaces 3.0 liters. The mill produces 265 horsepower and a whopping 425 lb-ft of torque, and uses the same transmission as the other versions of the SUV. Fuel mileage is a decent 19 miles per gallon in city driving and 26 miles per gallon on the highway.